The Southern US state of Alabama can claim W.C. Handy, the father of the Blues, Hank Williams, the country music superstar, and Muscle Shoals Studios where some of the greatest soul music was recorded. Rupert Parker hits the road and lifts the lid on sweet home Alabama. Mention the state and music and it’s likely that the song “Sweet Home Alabama” pops into your head. Unfortunately it was written and recorded by the Florida band, Lynyrd Skynyrd, but there’s much music history here. Famous Alabamians include W.C. Handy, the first to publish a blues song, Hank Williams, the father of country music, and Sam Philips, the producer who discovered Elvis Presley. There’s much to be said for making a musical pilgrimage here. The Alabama Music Hall of Fame presents an overview of music history with a great collection of memorabilia, there are individual museums dedicated to both Handy and Williams, and can you can visit the recording studios where the Muscle Shoals Sound was created. But this is not just an exercise in nostalgia as everywhere you go, you can still hear great live music – take your pick of blues, jazz, country, rock, soul, gospel, Cajun and bluegrass. It probably makes sense to fly into Nashville, hire a car, and incorporate some or all of the Americana Music Triangle – Nashville, Memphis and New Orleans. You’ll probably want to spend a couple of days in Nashville, then it’s just over a two hour drive to Muscle Shoals. 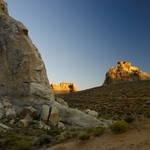 From there you can visit Memphis, or travel south to Birmingham and Montgomery. Four cities make up the “Shoals” – Muscle Shoals, Florence, Sheffield and Tuscumbia. These are not much more than small towns, even villages, and the region probably got its name from the mussels in the river. This is rural Alabama, completely unlike the big city hustle of Nashville and Memphis. It was local white musicians, backing mainly black singers, who created the funky blend of R&B, rock, country and gospel music, which we now know as the Muscle Shoals sound. Music is a way of life here and the Marriott Shoals Hotel features live sessions every night. 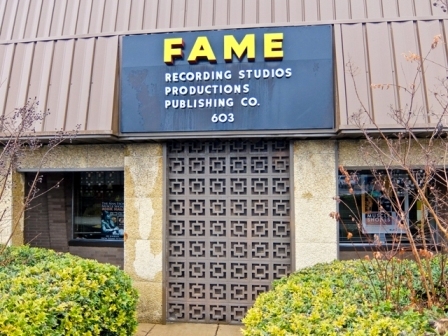 The FAME Studios are still very much in use today as top artists love the sound they can get here. There are guided tours every day, although access to the studios depends on who’s recording. The day I arrive, there’s a gospel session going on, so we sneak in while they’re recording. The studio is not particularly big or impressive, but so many great hits have been created here that it’s hard not to feel humbled. The assistant engineer is our guide, just taking a break before recording, and he gives us the history. 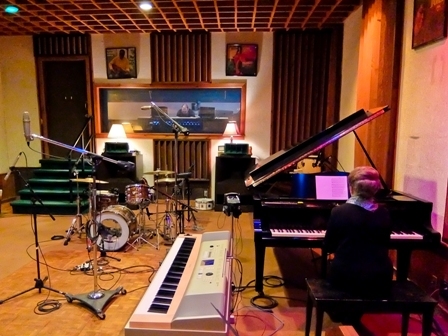 Rick Hall built the studios in 1961, after he’d success with Arthur Alexander’s “You’d Better Move On” and the present interior dates from 1979. Originally it was out in the middle of the countryside and it’s an unassuming building, now with a shopping development next door. Artists including Aretha Franklin, Little Richard, Wilson Pickett, Etta James, Otis Redding, the Osmonds, Jerry Reed, Alabama, Mac Davis, the Gatlin Brothers and Bobbie Gentry have all recorded here. Apparently Duane Allman once camped in the parking lot, until he convinced Rick Hall to allow him to take part in the sessions. 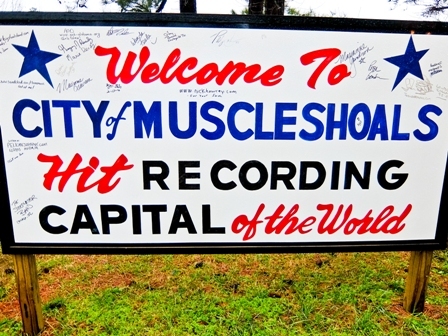 In 1969 Rick Hall’s house band, the Muscle Shoals Rhythm Section, left FAME and founded Muscle Shoals Sound Studio at 3614 Jackson Highway in nearby Sheffield. They were later immortalised as “The Swampers” in Lynyrd Skynyrd’s song “Sweet Home Alabama.” Their reputation was such that the Rolling Stones, Paul Simon, Bob Seger, Traffic, Rod Stewart, Cat Stevens, the Staple Singers, Levon Helm and Joe Cocker all came to lay down tracks. The studios are currently being restored to their original state and the plan is to have tours during the day and record at night. Just down the road in Tuscumbia is the Alabama Music Hall of Fame, in a modern purpose-built venue. I walk inside and pick my way through bronze stars embedded in floor, each one engraved with the name of an Alabama music star, and lit by a multi-coloured light show. They call this the Walk of Fame and it’s astounding how many stars were born in the state – Tammy Wynette, Lionel Richie, Emmylou Harris, Nat King Cole, Hank Williams, Wilson Pickett, Percy Sledge, Dinah Washington and Martha Reeves are just some of them. Inside, memorabilia from the careers of these and others are on display. There’s the original contract between Sam Philips and RCA records, when he sold the recording rights to Elvis Presley. 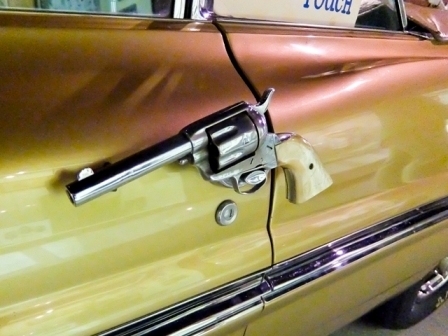 I like Web Pierce’s 1960 Pontiac convertible “Golden Country Car”, adorned with 500 silver dollars, 12 silver guns with a pair of Texas Longhorns on the radiator. But music is the reason I’m here and there’s a 12 foot Wurlitzer jukebox playing tunes by Alabamians, just in case you need reminding of the hits. 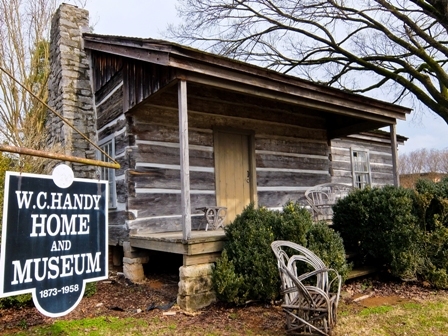 William Christopher Handy, composer of St. Louis Blues, Beale Street Blues, and Memphis Blues, was born in Florence in 1873 in a simple cabin built by his father. 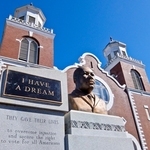 It’s been moved to a location outside town and is now houses a large collection of his personal papers and memorabilia. 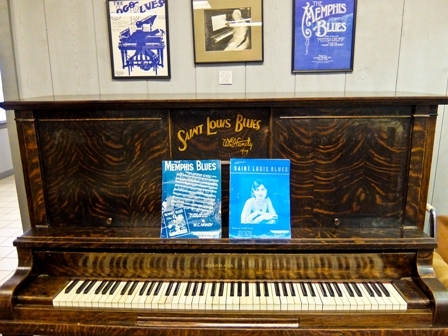 Handy himself gave money to set up the museum and he donated hand written original scores as well as the upright piano where he composed St. Louis Blues. I’d always thought he’d made his money ripping off the blues, but he spent years in obscurity playing trumpet in a jazz quartet. When he eventually wrote the Memphis Blues, he sold it for the princely sum of $50. 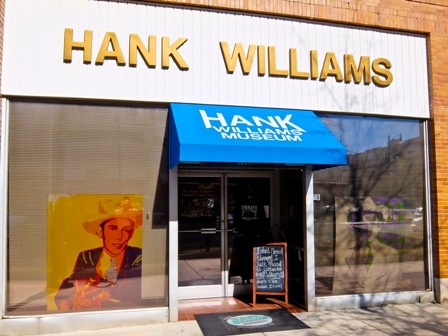 Further south, in the state capital, Montgomery, is a museum dedicated to Hank Williams. He was born in 1923 in Mount Olive, 50 miles to the south, but the family moved here in 1937. His career took off when he landed a regular spot on a local radio station, WSFA, in 1941. 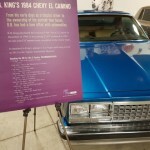 The museum houses the most complete collection of Hank Williams’ Memorabilia including Hank’s 1952 Baby Blue Cadillac, a collection of suits, guitars, piano and even the saddle for his horse. In the gift shop, you can still buy original 78’s of his greatest hits, proof that they pressed an enormous quantity of records. 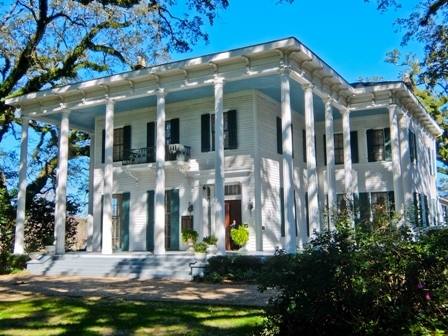 Just a mile from downtown is Oakwood Cemetery Annex where he’s buried. 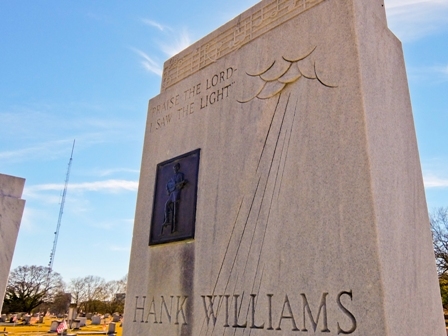 He died early at only 29, and what we see today was built by his son, Hank Williams Jr. The grave is decorated with carvings of Hank’s boots, guitar and greatest hits and there’s even a sculptured hat. On New Year’s Day a crowd gathers to pay homage with speeches by surviving band members and a mass singalong of “I saw the light”. If you really want to get a feel for the period he lived in then visit Chris’ Hotdog, in Dexter Avenue. It’s been here since 1917, and not much has changed since Hank was a famous customer. I can see the attraction of their winning combination of hotdog and hard liquor so I wash mine down with a shot of bourbon. If you hanker for hearing live blues then the ramshackle Gip’s Place, 20 miles outside Birmingham, is one of the last few remaining juke joints. It’s almost impossible to find, as there’s no sign, just a few Christmas lights hanging from the trees, but it’s well worth seeking out. Back in 1952, bluesman and gravedigger Henry “Gip” Gipson needed a place to make music with his friends, so he put up a tent in his backyard. These days it’s slightly more permanent but still not much more than a tin shed. British Airways, with American Airlines, flies to Nashville via Chicago.